It has been almost a decade since major chocolate companies committed to ending abusive child labor, forced labor and trafficking in their cocoa supply chains, but these abuses continue today. While many major companies have started to work with third party, independent organizations to trace their cocoa and institute labor standards among their suppliers, the Hershey Company lags behind all of its competitors in this area. Tell Hershey to Raise the Bar for responsible cocoa sourcing and begin using Fair Trade Certified cocoa! 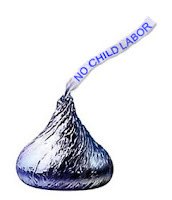 While many companies are working to trace their cocoa and institute labor standards among their suppliers, I am disappointed to learn that Hershey is lagging behind its competitors in this area. I believe you can be a leader in responsible cocoa sourcing. * a commitment to making at least one additional top five selling bar 100% Fair Trade Certified™ every two years thereafter, so that Hershey’s top five selling cocoa bars will all be 100% Fair Trade Certified™ within 10 years. NOTE: you can also download or order a DVD of THE DARK SIDE OF CHOCOLATE! You can host a screening of this documentary that exposes the ongoing use of trafficked child labor in the cocoa industry in your community. Click here to order your DVD and click here to download a screening toolkit.